Wow... that is all I can say to start. This is the first CD release by the German psychedelic rock band from Berlin in three years. Their other releases have been on vinyl only and either cover songs or long freakout jams. This also features quite a new line up of the band from the previous recorded material. The digipack CD has great psychedelic artwork and contains a picture of the band and all the lyrics. "State Of Mind" starts the CD and stays in the traditon of the band in that they successfully create good melodies and a 60's music vibe while retaining a more modern sound. Some great freakout guitar and studio effects. Clearly, the first two songs are targeted for a broader listening audience as they are in the 5 minute range, while all the rest of the songs on the CD are 7 to 15 minutes long. This is a great CD and for sure the best thing the band has ever recorded. Strong songs with good melodies but still plenty of psychedelia for the fans and some really experimental stuff at times as well. I was really taken by the almost heavy metal guitar riff in Paralyzed at the end. Great spaced out song. One of the best psychdelic CDs of the year for sure! 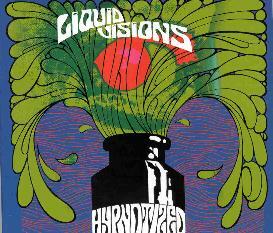 For more information you can visit the Liquid Visions web site at: http://www.liquidvisions.de.